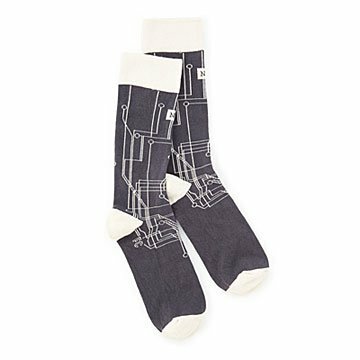 Whichever city is under foot, show your civic pride with a pair of these playful socks. Ambling through Austin or running to catch the A train in New York—whichever city is under foot, show your city pride with a pair of these playful socks. Each one is woven with iconic landmarks like Washington's Capitol and Seattle's Space Needle or local flavor like a Chicago hot dog. The bold patterns and cheerful colors make them great accessories for well-travelled guys. Cotton-poly blend. Made in Turkey. My son is a socks aficionadoâ€” fits right into his collection. Bought tne NYC socks for my husband as a Christmas stocking stuffer because New York is his favorite city. He loved them. Thin, but not overly so. Great conversation starter and stylish look. The perfect addition to my annual gift basket to my friend. He loves London and this is a unique way to let him keep his favorite city close. The socks were advertised to have a street grid of your chosen city. The Paris socks have the Eiffel Tower on them with a bunch of little lines running on the side. Not at all like the picture. Do. Not. Buy. Great unexpected gift for the man that enjoys traveling and likes to show his trendy style. this was a gift for my boyfriend. He mentions how comfy they are and loves to wear them when the AC has made the house nice and cold. They're probably gonna be as good in the winter. This is the perfect gift for someone who travels frequently! ALL THE GUYS IN MY LIFE LOVED THEM!! ALL THE GUYS LOVED THEM! Other than the word Chicago written on these socks, I cannot figure out why they are named city socks. The image on them is truly very confusing - nothing like I expected related to the city, and the color is just a terrible red. He will hate them, but perhaps they will be his "ugly Christmas socks" and begin a trend instead of a sweater.